Candy, despite its hyperactive reputation, seems to like the slow lane when it comes to production. Rebecca and I learned this the hard way (even if the company made the spoiled batches less annoying on balance) so you won’t have to. 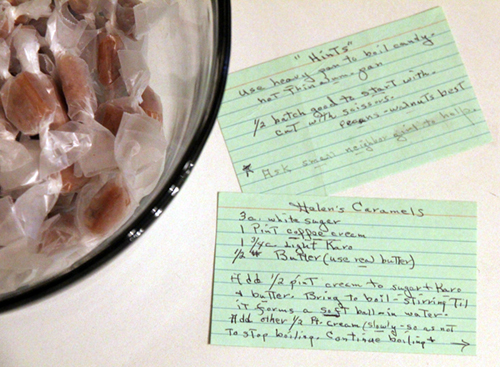 We were both having a little personal nostalgia trip with homemade candy recipes passed down from family. For my part, I pulled out my Aunt Helen’s Caramel recipe: small bites of soft-ish caramel sprinkled with pecans and individually wrapped in squares of waxed paper. Patience had not been the name of that wrapping game (though there surely must be a special place in heaven for any holiday baker who would allow a distractable six-year-old kid to be involved in candy making). At the stove, however, this proved to be the motto of the day. With the burner set solidly to medium, it was the slow rise in temperature, the careful stirring over the course of 40 minutes, and the removal of the molten sugar from the heat before it passed into the “hard as a rock” zone that won the day. It’s been a while since our family had the chance to open these familiar little packets of waxed paper as a signal of the holiday, and I’m looking forward to once again sharing these special treats. Rebecca adds: In his later years, my dad became a holiday candy maker and his patient nature was surely a factor in the success of his smooth fudge and Joe’s Chocolate-Almond Burnt Toffee. He wouldn’t let anyone into the kitchen during his experiments and kept his recipes closely guarded, but my mother testified to his long evenings spent slowly stirring and monitoring the temperature of batches that would make their way into gift boxes. After trying out his toffee recipe, and making our way through two batches (one disastrous), I’m glad I inherited his patience. This recipe is something of a study in chemistry, as the simple mixture of butter, sugar and almonds (topped later with chocolate and crushed pecans) makes its way from granular to melty, then moves into a panic-inducing phase where the butter separates into liquid and a clumpy mass, before finally coming together again in a thick, rich liquid gold as it hits the right temperature. This toffee has the somewhat grainy texture of a Butterfinger candy bar, rather than the hard crack of brittle. It brings out the buttery richness and the ultra toasty note of almonds. Perfect for those who aren’t into toothache-inducing holiday sweets. But the trick, as we learned with both candy recipes, is to find the experienced insider’s knowledge behind those simply written family recipes. Unfortunately, those are the very secrets candymakers keep to themselves. 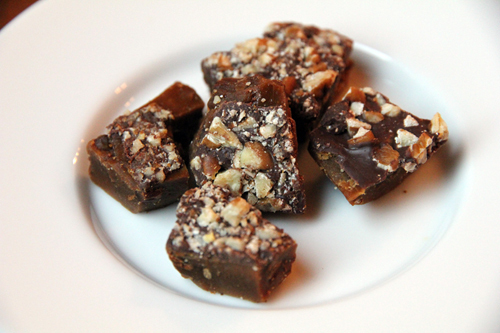 I used to make a toffee recipe with chocolate and nuts on top. I loved it, but it was dangerous for me to have around. I’ll have to bring the recipe to you. This was his best candy. I always took these out of the tin and kept them for myself before taking the tin into work. The first year he made this the results were not very good. I remember he took notes the first few years until he got it right. Don’t scoff too much 🙂 My mom long ago perfected peanut brittle in the micro. No one can tell the difference, and clean-up is a piece of cake. Plus no messy testing for hard-ball stage, etc. She goes by time and color alone.